LiveCode LessonsGetting Started with LiveCodeGet Up and Running with LiveCode My First ApplicationHello World! 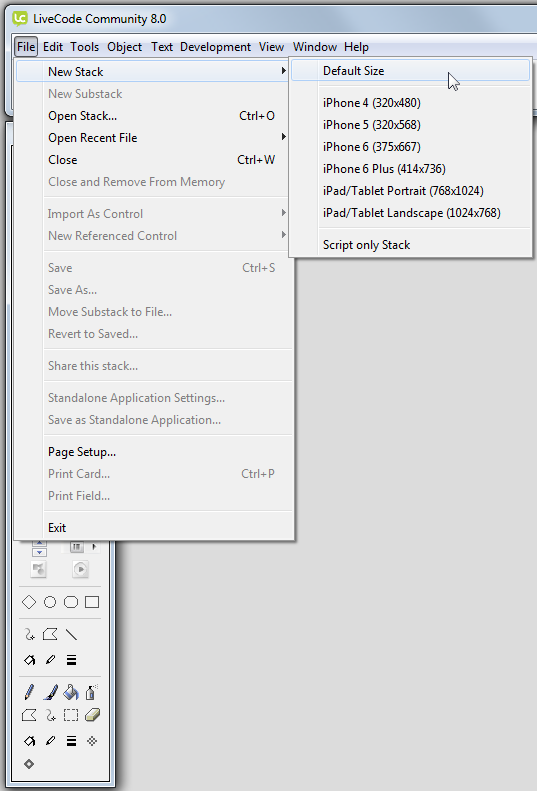 This lesson will show you how to create your first app with LiveCode. 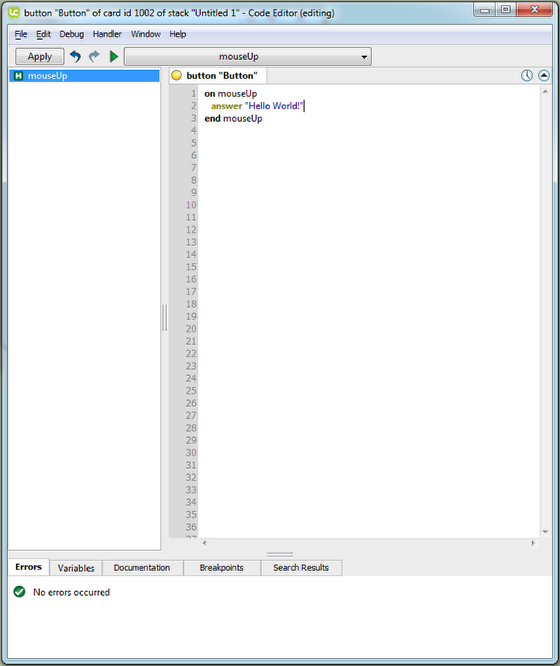 Start LiveCode, you will see the Integrated Development Environment or IDE. 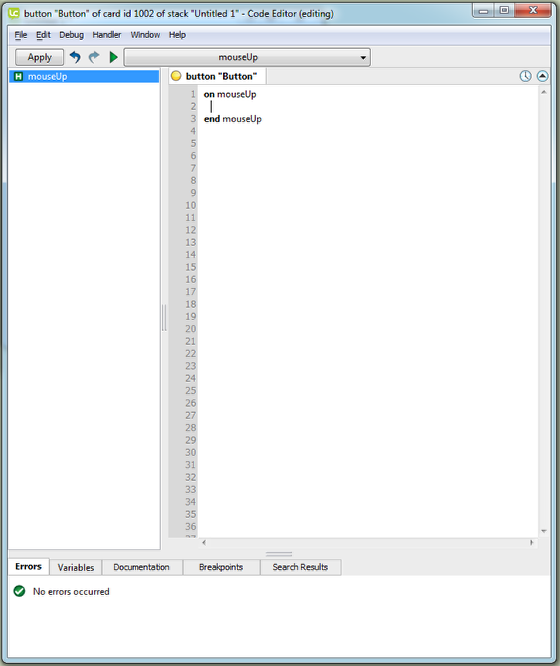 Select New Stack - Default Size from the File menu. Every project you create in LiveCode is a stack. 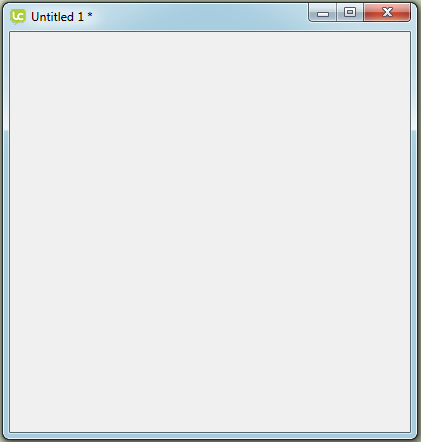 This is a new stack, it is a blank canvas ready for you to start creating your app. Drag a button from the Tools Palette onto the stack. 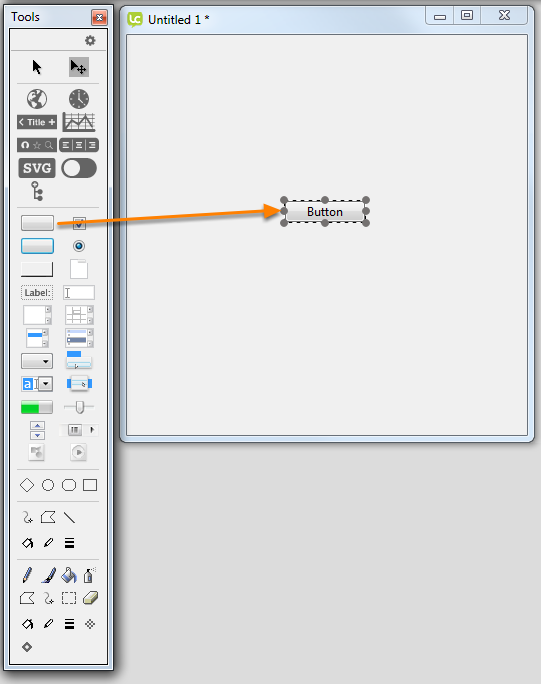 When you open the Code Editor for the button you will see it is pre-populated with an on mouseUp handler. The code you add in here will be executed when the mouse is clicked and released over the button. 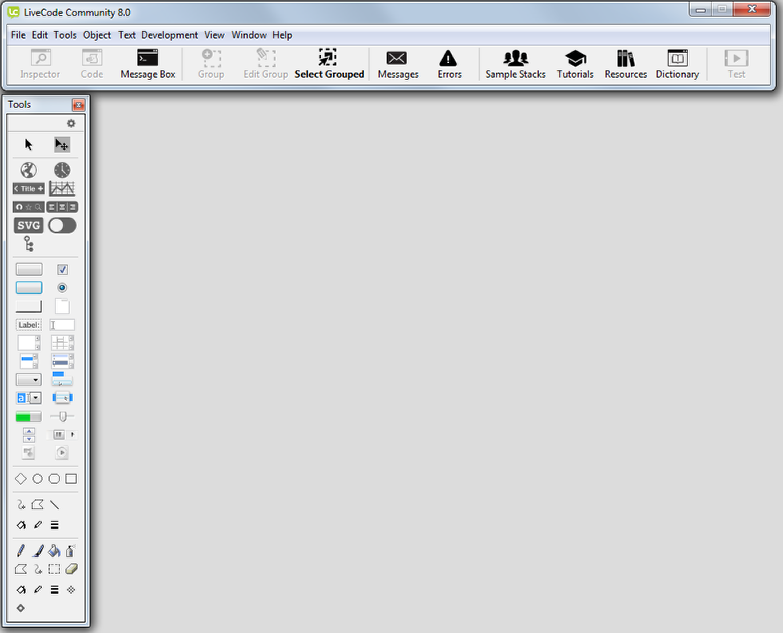 The answer command displays a dialog box with a message to the user. Click the Apply(1) button. The indicator(2) will turn green to show there are no errors. Switch to Run mode to interact with the app. Click OK to dismiss the dialog. Prev: How do I install LiveCode Server? So, I've started it. Good luck to me. sure you can do it. Fingers crossed. I have just started my journey to app development and believing livecode to be my guide. Hi Pius, crossing your fingers is bad for your health. You don't wanna start your journey without any fingers. Thanks, I've just installed LiveCode and finding it remarkably easy and user-friendly! it should not take very long at all to preview your application. As soon as you are in Run Mode, your application is ready to go for testing. If it took one second for "Hello Word" to switch to run mode, then that would be a long time. I am wondering if something is not set up properly. Is the course doable online only? I'm trying to find a pdf that I can download and then learn when I'm offline. I can't be on internet all the time. Each lesson has a link to Download Lesson PDF in the bar on the left hand side. 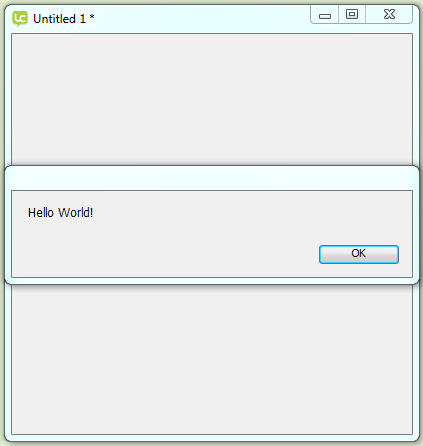 I just follow the step to write hello world, and I save it call helloworld.livecode under the type livecode stack. but my question is why the windows that show the button is still Untitlle 1*, do I need to find a way to save this too. And how can I make it become the exe in windows. I am starting off on the wrong foot here. I don't have all those features in my tools box. I only have two arrows, nothing else to choose from. What should I do? If that doesn't help please email support@livecode.com and we will look into it. I faced the same issue with you. First it was only two arrows appeared on the Toolbox. I just exit and re-opened and all tools displayed. hi there! i'm new in livecode. i try to save my work but it didn't work. how to save? which folder/location should i go? is there any application/software that i need to install ? im using linux 32 bit version, ubuntu 14.04, LiveCode community version 8.1.1.. i try to learn to develop for linux and android. thankyou. why "ANSWER" and not "DISPLAY" or "POPUP"
I think it probably comes from the fact that the user has to provide an 'answer' before the dialog is closed, but I'm not sure about that.